This is just a quick preview on what’s “cooking” at LensDigital lab. About a 2-3 weeks ago I started working on new Xronos Clock (ver 3.0). Xronos 2.0 has been out more than two years, and for a long time I’ve wanted to update this platform. Things like better Real Time chip, smaller enclosure, less expensive design. New clock will have a modular design with slim board to board connectors that will allow to add sound module, RFM, Bluetooth, WiFi, GPS, etc. Audio board will also be a separate add-on. But above all I wanted to start making my own LED displays. Sure Electronic’s 32×16 bicolor displays are nice and very affordable, however I had some serious issues with the company. As far as I’m ware they’ve changed design of their displays 3 times since I started using them. They do it quietly, without a single warning. I buy these in batches and I never know what I’m going to receive. First time they changed dimensions of the display slightly. Just enough so my laser cut enclosures became useless. That was a relatively small issue comparing two last change. In the last update these displays were switched from 5V to 12V and 16 pin IDC plug was changed to 10 pin. All of this was done quietly, and even Datasheet was never updated! Old displays still pop here and there on eBay auctions, but I said to myself that’s it, enough is enough. If I am to release new version of Xronos clocks I’m going to make my own displays from now on. I’ve spent a lot of time trying to find reliable supplier of 8×8 LED matrices and I found some. These are same red/green 3mm LED pitch displays that used in Sure’s ones. But just making one of these 32×16 displays doesn’t seem satisfying enough so I started to think what can I do differently. And idea hit me when I was riding in one of the newer NYC subway cars to work. Bright and colorful stops map display grabbed my attention. 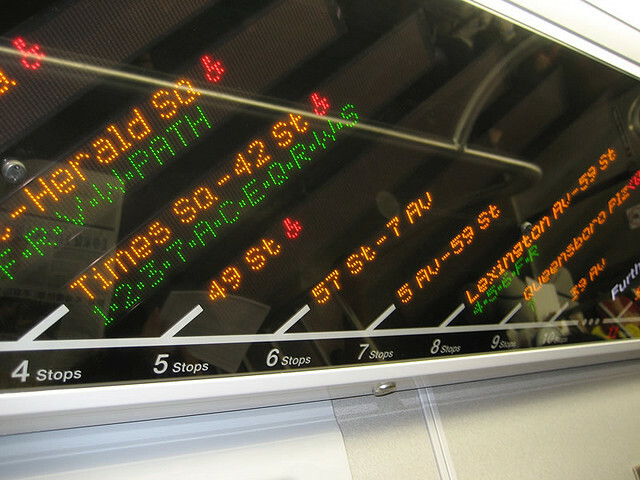 It had LED boards that showed name of the station, constantly changing. As I later find out it’s called “FIND” which stands for “Flexible Information and Notice Display”. I looked closer and noticed that those were some really small LEDs placed very close to each other. They still had that awesome LED look where you can see each pixel, yet it was like HD version of regular LED signs. And I thought to myself: wouldn’t it be awesome if I can find these in 8×8 matrices and make my own display boards? And yes indeed, my LED supplier confirmed that they make those! So I scrapped my old schematics and started designing new one. Old LED matrices were 32x32mm in size, new smaller once are just 20x20mm! This means that display will be just 80mm wide, that’s almost half of the old one! It might not be great for large LED signs that supposed to be read from big distance, but I think it will look awesome in clocks that are usually on your bedside table, book shelf or on the living room wall. But there was one difficulty. Being so small, these 8×8 LEDs are actually same size as HT1632c driver chip, so no longer can you place these ICs in between LEDs. 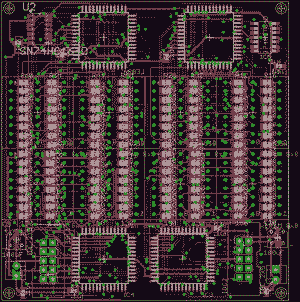 This requires for extra space on PCB that will not used for LEDs, making it larger than needed. So I spent a lot of time moving components around and had to increase height of the board to almost 90 mm. That’s basically same height as Sure’s display. However I’m thinking it will look best if I put two displays next to each other so I’ll be definitely making “XL” version of Xronos clock that will have 2 displays for a total of 64×16 pixels. Single color LED displays require far less driver ICs. For example 24×16 single color display needs just single HT1632c driver, so I can totally make it smaller. Sky is the limit, only time will tell if I succeed. But I am hopeful. Sample of LED matrices are on it’s way, and as soon as I verify they work as intended (which almost never happens), I’ll make PCB and then start prototyping.